In an atypically calm moment, Penn College students and faculty take a photographic pause from their Derby duties. The annual trek by Penn College students participating in the “culinary Olympics” that accompanies the Kentucky Derby recently drew the attention of USAToday. 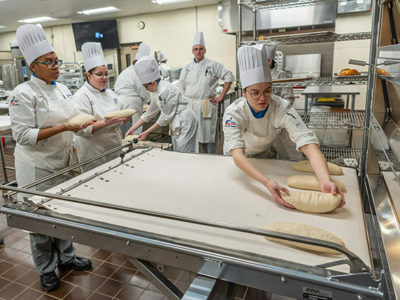 The article, headlined, “Churchill student chefs prep for 140,000 fans,” details the colossal work involved in food preparation for Churchill Downs and other Derby venues. Whether dicing beef, poaching shrimp or marinating turkey, the students relished the assignment as one more step toward their chosen career. “I have never seen this much shrimp before,” said Sarah B. Fiedler, a culinary arts and systems student from Lock Haven. “This is a once-in-a-lifetime experience.” Chef Paul E. Mach, assistant professor of hospitality management/culinary arts, was interviewed by WHAS11 in Louisville for a segment that also features students seasoning beef and making apple cobbler. What an absolutely wonderful experience for our students! Congrats to you all! I was thinking about this group while watching the Derby on Saturday. Looking at the massive crowd, I tried to imagine the exhilaration and adrenaline our students were experiencing. Congratulations to the students and to Chef Paul, marking a silver anniversary at Churchill Downs. Rewarded with national exposure for Penn College!